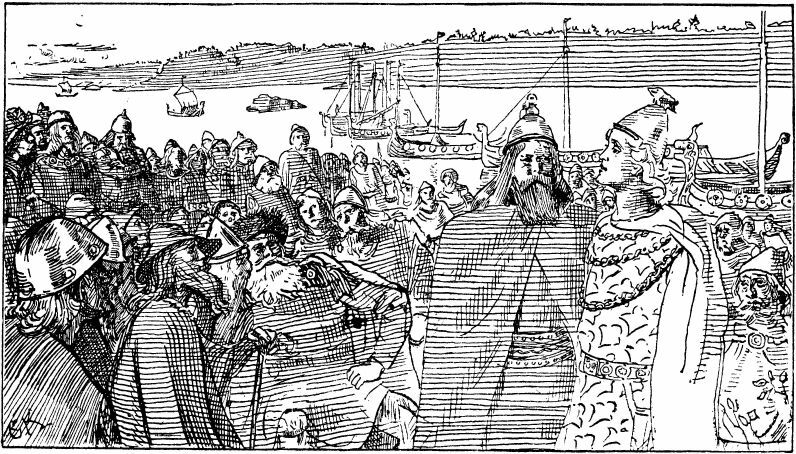 While she is little-known outside Scandinavia today, Queen Gunnhildr from Arctic Norway was, during her reign in the Viking Age, one of Europe’s most powerful woman, almost single-handedly exemplifying the image of the strong-willed Viking woman. According to Old Norse-Icelandic sagas, Gunnhildr was the daughter of the North-Norwegian chieftain Özurr Tóti (“the teet”, oddly enough). At a young age she was sent to live among Sámi magicians in the region of what is now Finnmark, far from the Norwegian settlments, in order to learn magic. In the Viking and Middle-Ages, the Sámi were indeed thought to be endowed with gifts of superior magical power and Norse women were equally associated with both sorcery in divination. In the Northern parts of Norway, where Sámi and Norwegian contacts were stronger than anywhere else, such a fosterage likely seemed natural enough. Living with the magicians, the young Gunnhildr learned quite a bit, but after a while, she started to realize that her teachers actually desired her as a wife and not solely as a student and she wasn’t all that keen about it. Unable to leave the watch of the wizards, Gunnhildr attempted to obtain help from passing travelers but all of them quickly disappeared as soon as the sorcerers found out about their plans. This rather tense situation continued until one day, Eiríkr Blödöks (“blood-axe”), a fierce Viking and son of the then king of Norway Haraldr hárfagri (“beautiful hair”), who was harrying in the region showed up in the magicians’ tent and, bewitched by Gunnhildr’s beauty, quickly and successfully dispatched of them. The pair got married immediately after arriving in the king’s estates. Soon, in the year 930, Eiríkr would even come to be crowned King of Norway. Helped by Gunnhildr, Eiríkr ruled over the country with an iron hand, until his half-brother, Hákon góði (“the good”), who had been sent into fosterage in England in the court of the English King Æthelstan returned to Norway and chased the royal couple away. Gunnhildr and Eiríkr then decided to head for the Viking-dominated Orkney Islands which they took over and headed as supreme rulers. For a few years, the powerful couple reigned over a maritime empire that controlled the sea-lanes between Scandinavia and Scotland and exerted thus incomparable power. Soon after, the royal couple took over the English town of Jorvík (now the modern city of York). There, Gunnhildr was said to engage in all kinds of sorcery such as cursing and supernatural poisoning. 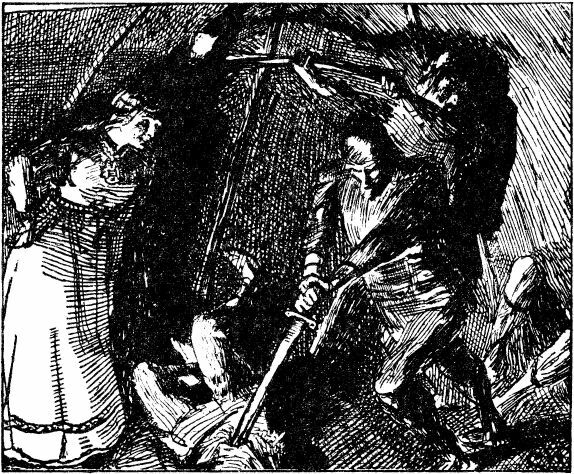 Her victims included both her (half) brother-in-law Hákon as well as the Icelandic chieftain Egill Skalla-Grímsson (“son of Grímr the bald”) whom she cursed so that he may never find peace in his native Iceland, leading him to become Britain’s most-feared mercenary, serving, interestingly enough, King Æthelstan himself. Despite their powers, maintaining such a mighty seat required a lot of warring, ranging from the Hebrides to Spain and soon enough, Eiríkr died in battle. Following this catastrophic setback, Gunnhilðr married her daughter to the new Norse ruler of the Orkneys and moved to Denmark with her sons. From there on, the cunning Queen managed to obtain Danish support and her sons were given the command of an army of local Vikings. In 961, Gunnhildr’s sons sailed to their native Norway to defeat and kill their uncle Hákon and took control over the whole country. Gunnhilðr, now back to her homeland took control of the politics of the kingdom and coordinated power-sharing between her sons. 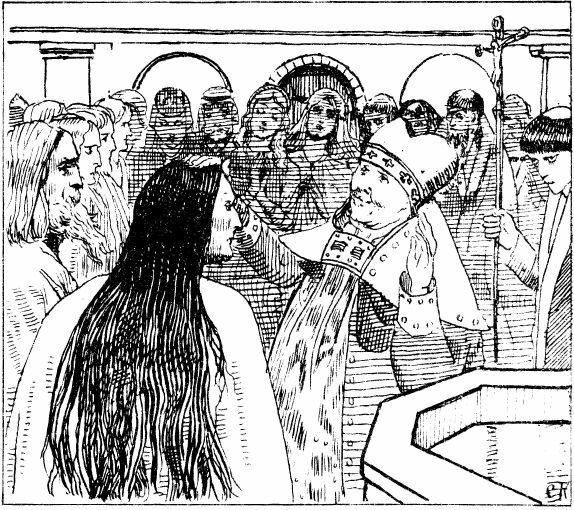 This is when she became known as konungamóðir (“mother of kings”). While it was Haraldr gráfeldr (“grey-cloak”) who then was then the nominal king, in practice, all of Gunnhilðr’s sons had a say in the ways the Kingdom was ruled…thanks to their mom’s! 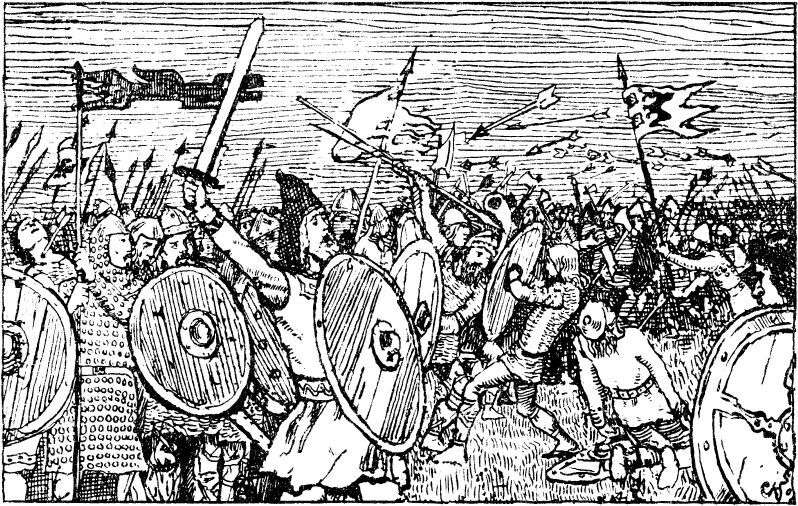 The sons of Gunnhildr defeated their uncle Hákon at the battle of Fitjar near Bergen in 961. Unfortunately for Gunnhildr, her control of the country did not last long and was broken when Hákon Jarl turned against her. Hákon, the son of Siguðr, the Jarl (“Earl”) of Hlaðir (near the modern city of Trondheim) had indeed been orphaned by Gunnhildr’s sons who had his father, a staunch supporter of Hákon, killed to prevent him to oppose them. In 970, Hákon decided to get rid of Gunnhildr and her sons by seeking an alliance with Denmark, promising King Haraldr blátǫnn (“dark tooth”) direct rulership of the Víken area (the region surrounding nowadays Oslo). Haraldr agreed to Hákon’s proposal and let him get rid of the rqther unpopular sons of Gunnhildr. Once these had been taken care of, Haraldr invited Gunnhildr at his court, only to have her drowned in a bog once she arrived in Denmark. This event, generally believed to have taken place around 980 is the rather tragic conclusion of the eventful life of Gunnhildr, a North-Norwegian woman whose rule once extended over Norway, Britain and Scotland, pulling even closer the isle of Albion and its neighboring Norway. (1) Storm, Gustav (Trans.). (1930). Snorre Sturlasson Kongesagaer. Oslo: J.M. Sternersens Forlag. (3) Ólafur Halldórsson (ed.) (2010). Ólafs saga Odds in Færeyinga saga; Óláfs saga Odds. ÍF XXV (123 – 362) Reykjavík: Hið íslenzka fornritafélag. (I) Slaget i Hafrsfjord (1899). Gerhard Munthe. in Snorre Sturlasson Kongesagaer. First edition. Christiania: J.M. Stenersen & Co.
(II) Gunnhild på Orknøyane etter ho har mist sønene sine (1899). Christian Krohg. in Snorre Sturlasson Kongesagaer. First edition. Christiania: J.M. Stenersen & Co.
(III) Gunnhild lar finnene drepe (1899). Christian Krogh. in Snorre Sturlasson Kongesagaer. First edition. Christiania: J.M. Stenersen & Co.
(IV) Håkon taler på tinget til trønderne (1899). Christian Krogh. in Snorre Sturlasson Kongesagaer. First edition. Christiania: J.M. Stenersen & Co.
(V) Dronning Gunnhild blir døpt av en engelsk biskop (1899). Christian Krogh. in Snorre Sturlasson Kongesagaer. First edition. Christiania: J.M. Stenersen & Co.
(VI) Hold fram som du stevner (1899). Christian Krogh. in Snorre Sturlasson Kongesagaer. First edition. Christiania: J.M. Stenersen & Co.